Think it's hard to get a job? Try being a young black man with an electronic monitoring bracelet on his ankle for a felony conviction. That's Brian Scott. But Mr. Scott, 24, of the West End, has some things other young black men with a resume that includes a stint in the Allegheny County Jail don't: He has two suits for interviews, he wears a tie and he has the support of Leroy Hayes and Michael Rogers, co-coordinators of the Young Fathers Program at the Hill House Association in the Hill District. The two men have taught Mr. Scott a truism he had not heard before: Clothes may not make the man, but they can unmake him. 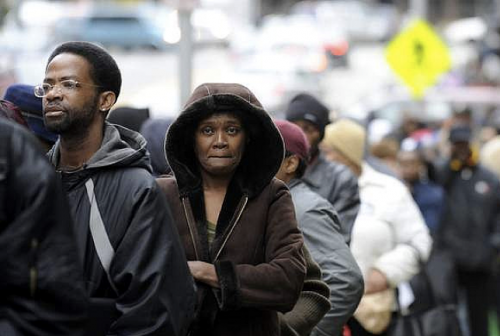 In this Great Recession, black men have been hit particularly hard. On Friday when the U.S. Bureau of Labor Statistics released the unemployment numbers for September, the overall population was suffering an unemployment rate of 9.6 percent. Unemployment in the black community was 16.1 percent. And while unemployment for black women dropped from 13.2 percent to 12.6 percent, the rate for black men rose from 17.3 percent in August to 17.6 percent in September. There are now 1.4 million black men out of work nationally. The numbers look even worse for black teenagers. While the overall teen population had an unemployment rate of 26 percent, the white teen population had 23.4 percent unemployment and black teens had 49 percent, up from 45.4 percent in August. Unemployment rates based on race are not broken out for the Pittsburgh region. To call economic conditions in the African-American community a crisis is to understate the problem because the situation black men are finding themselves in could follow them for the rest of their careers. "This high unemployment that blacks are facing is going to go on for years based on the current economic projections," said Algernon Austin, a sociologist with the Economic Policy Institute, a nonpartisan research center in Washington, D.C. "Blacks are going to have double digit unemployment until 2014." Even as the recovery slowly takes hold, Mr. Austin said none of the projections call for unemployment among blacks to fall much below 10 percent. "It's a dire situation and unfortunately not many people are treating this as a crisis. ... Even college-educated blacks are facing high unemployment." Some of the reasons for the intractable problems are a function of economics as much as they are the product of generations of discrimination. For example, Mr. Austin said those living in a black community with high unemployment may have more problems finding new jobs because the people to whom they would naturally turn -- friends, families and neighbors -- are also experiencing high unemployment. Dedrick Muhammad, one of the authors of the report and a research associate for The Institute for Policy Studies, said a number of factors go into those numbers. 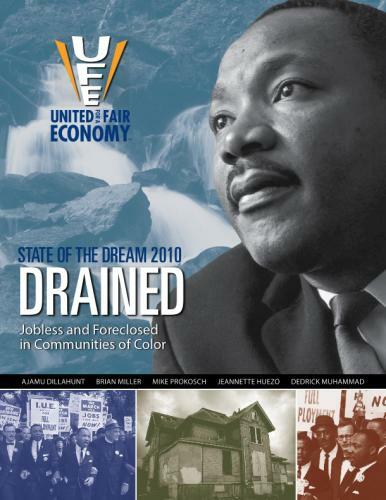 College-educated African Americans typically have higher levels of student loan debt because their parents don't have as much money to finance their educations; black homeowners in African-American neighborhoods have homes worth 10 percent to 15 percent less than comparable homes in white neighborhoods; and blacks at all levels of the income spectrum were targeted with subprime loans at a higher rate than whites. "Any type of bump in the road can be really serious just because there is no wealth to back that up," Mr. Muhammad said. "Most people use their social network in times of crisis, but when your whole social network is in crisis, there's no ladder to climb out."